I had discovered very recently that according to the legislation in Colombia regarding flags, there is an official War Flag for almost every official institution, that is, the three branches of government (Executive, Legislative, Judicial) at almost all levels (National, Regional, Municipal). I have come to the conclusion after searching for official flags and found out that most of the times there are two official flags: Bandera de Guerra (War Flag), which is the Colombian tricolor, with the motto REPUBLICA DE COLOMBIA on top, and the corresponding institution's name on the bottom and sometimes the "additional official flag" or more precisly, the Estandarte (Standard). Decree No. 861 of 1934 (May 17) describes the War Flags on Article 3. The dimensions mentioned there on this same article, are for the Army flag, but they are the foundation for all other flag legislation onwards. However, there is a slight difference according to current dimensions of flags. On Article 3 of the previously mentioned Decree, says that "...will be 1.30 meters long, by 1.10 meters wide...", but there is an ammendment by Decree No. 62 of 1934 (January 11) that says that the actual specifications are "...1.35 meterslong by 1.10 wide...". The "the latest legislation on the use of the Flag, Coat of Arms and National Anthem is online at the Colombian Ministry of Communications website. In Article No. 8 of this Decree it says that the Bandera Nacional (National Flag), the official name of the Colombian flag, can only be used with the Coat of Arms by the President and the Armed Forces, being called Bandera de Guerra (War Flag). Then on Article No. 12 it says that the Coat of Arms can be used in the Bandera Nacional del Presidente de La República (President of the Republic National Flag), War Flags, and official documentation. Thus, the name that appears as "official flag" is actually Bandera de Guerra (War Flag) and the name "additional official flag" is actually Estandarte (Standard). Ratio ~4:5. Adopted: 17 May 1924. In use except small changes of the shield. In the red circle the name of the army unit that is using it should be written . This flag and the Cavalry Flag are my "reconstruction" with what I think is reasonable to expect what's written on the red ring, exaple for a mounted unit and example for the Army (assuming that the army as whole would have the infantry version of the colours). The image is based on site <www.escaballeria.mil.co>. There are few photos of the flag there but non good enough to provide for the text. I was not able to find an other infantry unit, so the Cavalry Flag image is maybe a streching a bit too far. Article 3 - the war flag used by the Army is one meter and thirty centimeters long and one meter and ten centimeters wide for the units on foot and the standard for the mounted units should be one meter long and one meter wide. These flags shall have in the center the coat of arms of the Republic surrounded with a ring of red (velvet?) five centimeters wide and forty centimeters of the outer diameter in which is inscribed in golden letters the name of the unit to which it belongs. Decree Nr. 62 of 1934 (January 11) - 208. The war flag used by the Army shall be, in accordance to the law, one meter and thirty five centimeters long and one meter and ten centimeters wide, for the mounted units. This flag shall have in the center the coat of arms of the Republic, set in an oval of red cloth on which shall be inscribed, in letters outlined in gold the name of the unit or military division to which it belings. 209. The flag with the coat of arms shall only be used by the armed forces of the Nation. The military flag (a.k.a war flag) can be seen in a photo showing Colombia's Foreign Minister, Fernando Araujo, left, shakes hands with U.S. Deputy Secretary of State John D. Negroponte in Bogota, Tuesday, May 8, 2007. Military flag as legislate and as it is. Naval ensign, military flag and cavalry standart was kept without change by resolutions 64 (9-1-1961) and 4235 (1965) and still in use. Ratio 1:1. Adopted: 17 May 1924. In use except small changes of the shield. Cavalry standart as legislate and as it is used. Naval ensign, military flag and cavalry standart was kept without change by resolutions 64 (9-1-1961) and 4235 (1965) and still in use. The Cavalry Flag is not really a flag. It is merely the Colombian flag with a sumperimposed shield. I have seen this symbol many times in armored units of the Army in Bogota (Capital of Colombia). What the shield reads is: "Republica de Colombia - Ejercito Nacional - Escuela de Caballeria". The "Escuela de Caballeria" is actually a training facility located in Bogota to train the soldiers and officers in charge of the armored units of the Army. You can also find several "Caballeria" facilities troughout the country as they are used on a permanent basis to support ground troops that engage in combat. In the front dor of the Military Hospital, in Bogotá, Colombia, there are three flags in plain color: dark blue, light blue and red. I supose that the flags are just versions without the coat of arms, of the flags of the Army (EJC), Navy (ARC) and Air Force (FAC). I have also seen the red flag at the Cadet School, in Bogota. Comando General de las Fuerzas Militares - Colombia (General Command of Military Forces) - This flag can be seen (in an arty, animated way), at the frame "organizacion" at <www.mindefensa.gov.co>. Website at <www.cgfm.mil.co>. The flag is divided into three horizontal equal stripes, with light blue (top), red (middle) and dark blue (bottom). The CGFM (for its initials) was created by Decree No. 835 of April 16,1951 and its in charge of the Planinng and Strategic guidelines of the Colombian Armed Forces. I would also like to mention that the colors of this flag are the same (only inverted) to the flag of British Joint services, so probably the Colombian military use this flag to design their own. The colors on the Colombian CGFM flag are light blue on top (airforce), red on the middle (ground forces) and dark blue on the bottom (navy). However, in the shield at the center of the arms the symbols of the services are, top to bottom, Army (rifle), Navy (anchor) and Air Force (winged mini-shield). Perhaps they were placed in order of seniority. This is correct: The symbols displayed (from top to bottom) are indeed in order of seniority. The Army was the first Force (its foundation date is considered 1819, the year the Battle of Boyaca was fought and Colombia gained its independence from Spain). The second Force was the Navy (its foundation date is considered to be 1824, the year the Naval Battle of Maracaibo was fought, defeating the whole Spanish domain in the South American territory, except for minor engagements that took place inland in 1825). The last Force created was the Air Force (its foundation date is considered to be 1919, when Colombian President Marco Fidél Suárez established the Air Arm, as a Branch of the Army). All military flags in Colombia have one version in tricolour flag and the other one with the Coat of Arms and background colors. 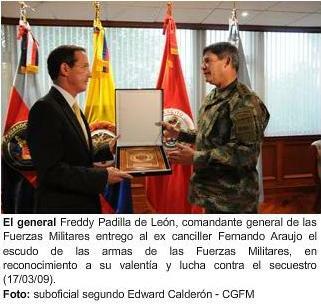 Sources for the first version are <www.cgfm.mil.co> and <www.mindefensa.gov.co>. The color composition of additional official flag is as follows: Light blue on top, which represents the Air Force, and should be the same shade as the Air Force plain flag. Red in the middle, which represents the Land Force (Army), and should be the same shade as the Army plain flag. Dark blue on bottom, which represents the Sea Force (Navy), and should be the same shade as the Navy plain flag. In the obverse it has the coat of arms and on the reverse it is plain. The organizational chart of the General Command of Military Forces is seen here. The previous organizational chart is based on Resolución No. 0606 of 2005 of the Ministry of National Defense and Disposición No. 018 of 2005 the CGFM. This is a variant of the CGFM flag. The variant is the Coat of Arms which is encircled on a black disc, the letters are in yellow and the flag has a yellow embroided border. The source is a photo taken on Colombia Independence Day, July 20, 2006. On March 19, 2009 on the official website of the General Command of Military Forces, a picture appears showing the General Command of Military Forces Flag (variant) with a streamer of the same colors. Image is a screenshot of the official website of the General Command of Military Forces taken on March 19, 2009. It is a cravat rather than a streamer. The Estado Mayor Conjunto (Joint Chiefs of Staff) is below the General Command of Military Forces Flag in the hierarchy of flags on the iIlitary Flags section. This post is held by the Segundo Comandante y Jefe de Estado Mayor Conjunto (Vice Commander and Chief of the Joint Chiefs of Staff) and it is in charge of the Command functions delegated by the government, becoming a virtual Commander General. The War Flag (Colombian Tricolor with the respective country's Coat of Arms, plus the legend REPUBLICA DE COLOMBIA on top in bold capital golden lettering) has the words ESTADO MAYOR CONJUNTO on the bottom in bold capital golden letters. Picture can be seen here. The original article dates back to August 15, 2006 published on the official website of the Colombian Presidency. The flag of Colombian Amazon Conflict Veterans is located at: the online official website of the Military Forces General Command. The Colombian Amazone Conflict refers to an armed border dispute between Colombia and Peru, between 1932 and 1933. For further reference please see: wikipedia. Between the dates "1932" and "1933" there is a map of Colombia in yellow (50%) on top, blue (25%) on the middle and red (25%) on the bottom. There is also a pair of crossed boughs in the lower stripe. This is the official flag of the Korean War Veterans from Colombia. It is the same as the AFEAU flag, only that on the bottom fringe it reads "VETERANOS DE KOREA" (Please notice that Korea is spelled in English, because in Spanish it is Corea, but somehow they put it in English). The picture was taken from the website of the Ministry of National Defense (<www.mindefensa.gov.co>) durign the 50th anniversary of the participation of troops from Colombia in the Korean War, under the US command leading the UN-forces. In the picture are the former Minister of Defense and the former Commander General of the Military Forces back in an award ceremony in 2002. On February 24 of 2008, I went to a military fair held in one of the newest shopping malls built recently in Medellin. There they had military equipment and gear, as well as videos, weapons. It was attended by present active, retired, reserve and veteran military personnel. It is on red background, charged with the lion of the Coat of atms of the Batallón Colombia with the yellow letters ASVEGIC on top. The Standard of the Caja de Retiro de las Fuerzas Militares (Military Forces Retirement Fund). The abbreviation in Spanish is CREMIL. It is the organization in charge of pension related issues of the Military Forces. The Standard has the same proportion in as the Colombian flag, that is 50% of the flag is one color (in this case red, representing the Army), and the other 50% is divided into two; 25% of dark blue representing the Navy) and the other 25% in light blue (representing the Air Force). The motto on the Coat of Arms is "SERVICIO JUSTO Y OPORTUNO". Tha Standard has the Coat of Arms on a white circle added to the above mentioned flag. However the black letters that appear on the flag itself I cannot identify. I have found an article on their official website showing the flag in a better resolution. Notice that the black letters around the Coat of Arms are simply the name of the institution. On the top it reads "CAJA DE RETIRO DE LAS", and on the bottom it reads "FUERZAS MILITARES". 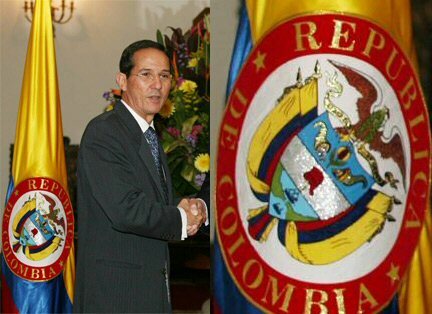 In the same article, one can see the war flag of the CREMIL on the left hand side of the picture, which is the Colombian tricolour and on the top of the Colombian Coat of Arms it reads REPUBLICA DE COLOMBIA and on the bottom it reads CREMIL, both in golden letters. CORASA (Corporación Reserva Activa y Sociedades Aliadas) (Active Reserve Corporation and Allied Societies) is a non-profit organization which seeks to strengthen the dignity of the active reserve and to promote a better life quality standards through housing, courses, employment and entrepreneurship. The flag can be seen here (picture taken on August 20, 2010 during an awarding ceremony, by the General Commander of Military Forces). The flag is a horizontal flag, with a white diagonal cross, white on top, red on both sides and blue on the bottom, plus the logo. The logo has three concentric circles, light blue, blue and red representing the members of the Armed Forces, plus the motto which is on silver capital letters "UNIÓN Y PATRIA" (Union and Fatherland). On the red concenctric circle, it reads the name of the association on top in silver letters, "ASOCIACIÓN DE SOLDADOS PENSIONADOS DE COLOMBIA", and on the bottom the initials of the Association, "ASOPECOL", in silver capital letters as well. The picture of the flag is found here. To me the logo in the middle looks like two arms turning into a 45� angle wearing olive green uniform sleeves, the hand on the left being a closed fist, and the hand on the right having a steel arm prosthetic, much like the one seen in this picture (left hand), both arms surpassing a steel helmet in the middle. There's a Veterans organization called ACORE (Aosciación Colombiana de Oficiales en Retiro de las Fuerzas Militares, in English Colombian Association of Retired Officers of the Military Forces). It was established on November 25, 1960 for the purpose of gathering retired officers in ther day-to-day activities as "civilians". The flag has the same color pattern as the General Command of Military Forces Flag - Standard, only the colors are in a different order (red on top, dark blue in the middle and light blue on the bottom) maybe meaning that the Army was the first being established, then the Navy and the last one was the Air Force. The flag has the ACORE CoA in the middle. The flag is seen here. Also the Dirección (Directorate) has a flag as well, which would be a War Flag (Colombian tricolor, with the CoA on it, with the lettering DIRECCION on the bottom fringe), as seen here. The ACORE (Asociación Colombiana de Oficiales en Retiro de las Fuerzas Militares) (Colombian Association of Military Forces' Retired Officers) was established on November 25, 1960, as the Asociación Colombiana de Oficiales en Retiro del Ejército (Colombian Association of Army Retired Officers), then it included all retired Officers from all the other forces (Navy and Air Force). The ACORE flag is seen here. It is horizontally divided into three equal stripes having a similar color configuration as the CGFM Standard, the only difference being the order of the colors. ACORE's flag has red (top), navy blue (middle) and light blue, each color standing for the respective force's color. In the middle is the Coat of Arms of ACORE, which can be seen here. The motto below the Coat of Arms reads PATRIA * UNION * PROGRESO (Fatherland, Union, Progress) in white capital letters, as seen here. For additional information please see: ACORE (Official website). The FECODEMIL (Federación Colombiana Deportiva Militar) (Colombian Military Sports Federation) was established by Decree No. 3938 of December 27, 1950 as the "Dirección General de Educación Física y Deportes Militares" (Physical Education and Military Sports General Directorate) and it was affiliated to the CISM August 29, 2002 in Brussels, as the 123rd Federation. A reenactment of the Ruta Libertadora (Freeing Route, the final military campaign that established Colombian full independence from Spain in 1819. although several battles were fought later on, official website at <web.presidencia.gov.co) was established to take place from July 20, to August 7 of 2009 to commemorate the 190 years of this campaign. This reenactment is part of a series of events leading up to the Bicentennial of Colombia's independence. During the celebration of the Army Day, held on August 7 as a commemoration of the Battle of Boyaca (August 7, 1819) that gave Colombia its total independence, a pennant has been spotted at <www.mindefensa.gov.co>. Looking at an unnofficial website of the Military Forces of Colombia, I found a better picture for this Pennant. It seems to be the official Pennant of the Ruta Libertadora, as the flag displays a color silouette of General Bolívar's bust, and below him in small capital white letters it reads: "POR LOS CAMINOS DE LA RUTA LIBERTADORA" 1810-2009 It is a tricolor pennant, following the same pattern of the General Commanding a Military Unit Pennant. There is also a cloud of words around his head - battles?